Some days you are just glad to get to the end of, and I have to say that today has been one of those. 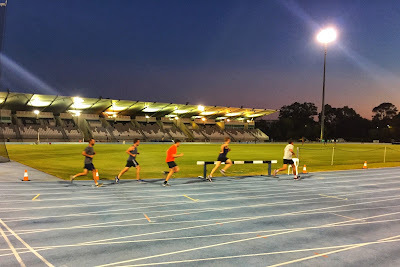 coach a track session tonight. The list was long, and some parts of it were a little unpleasant. I am very glad to be getting to the end of it. The day wasn't all hassle and unpleasantness though. The ride this morning was a lot of fun and I think everybody had a pretty good session out. Leaving drinks are never really a hassle and the track session tonight was another good one. I guess I shouldn't really complain too much. At least the next four days shouldn't be quite so busy. With Easter here we all have four beautiful days off work and I am hoping that they end up being fairly relaxing, well at least a little bit. I have a bit of coaching tomorrow, Saturday and a little bit on Monday, but other than that the days are my own. I am hoping to fit in a bit of exercise and we have also decided to re-arrange almost every item of furniture in our house. Actually writing it like that it doesn't sound all that relaxing but surprisingly I think it probably will be. Still lots to cram into this long weekend, however, before we get on with that it is time for a bit of sleep.